Tite-Seal Self-Adhesive Waterproof Flashing Butyl building material Cofair Products, Inc.
TITE SEAL All Purpose Flashing is composed of a self-adhesive, waterproof, slip-resistant material with an aggressive rubberized asphalt adhesive that will provide a barrier against water infiltration in areas prone to leaks. It is designed for use on Valleys, Drip Edges, Chimneys, Skylights, Ridges, Dormers, Windows, Doors, roof to wall transitions and more. SURFACE PREPARATION AND INSTALLATION: All surfaces receiving Tite Seal All Purpose Flashing must be clean, dry, and structurally sound. Prior to installation, remove all dust, dirt, loose nails and other loose material. Protrusions through the substrate should be removed prior to installing the flashing material. Tite Seal All Purpose Flashing can be applied directly to most construction materials, including wood, metal, concrete, wood composition board and gypsum sheathing. Whenever applying to concrete, masonry, wood composition board and gypsum sheathing, priming is required to achieve proper adhesion. DIRECTIONS FOR USE: Apply Tite Seal All Purpose Flashing when air and substrate temperatures are a minimum of 45 degrees F or warmer. Cut flashing material to length. Remove release paper and press in place. To maximize adhesion, the use of a small hand roller is recommended. When applying to a sloped area, installation should begin at the low point and proceed up the slope of the roof. 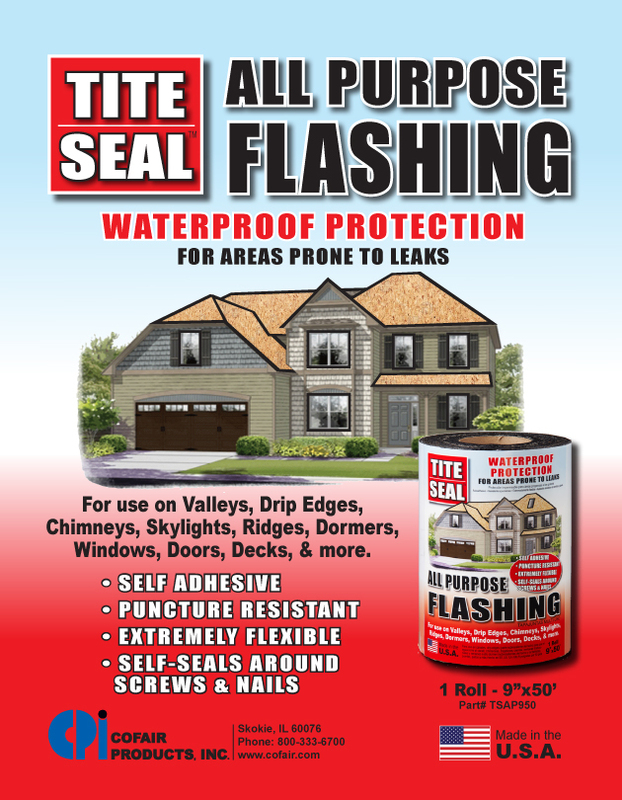 PRECAUTIONS AND WARNINGS: Tite Seal All Purpose Flashing is slippery when wet. Use caution when walking or standing on the flashing material. Tite Seal All Purpose Flashing is not designed to be permanently exposed to sunlight, and should be covered within 30 days. Tite Seal All Purpose Flashing is incompatible with EPDM, TPO, flexible PVC, and uncured neoprene. If fasteners are removed from membrane, or other tears or holes occur, they must be repaired prior to covering the membrane. Do not fold or bend flashing material over the roof edge unless the area is protected by a drip edge, gutter, or flashing.